I’m going to join the cool kids, and post a picture of the knife I carry daily – a partially serrated CRKT Mt. Rainier. 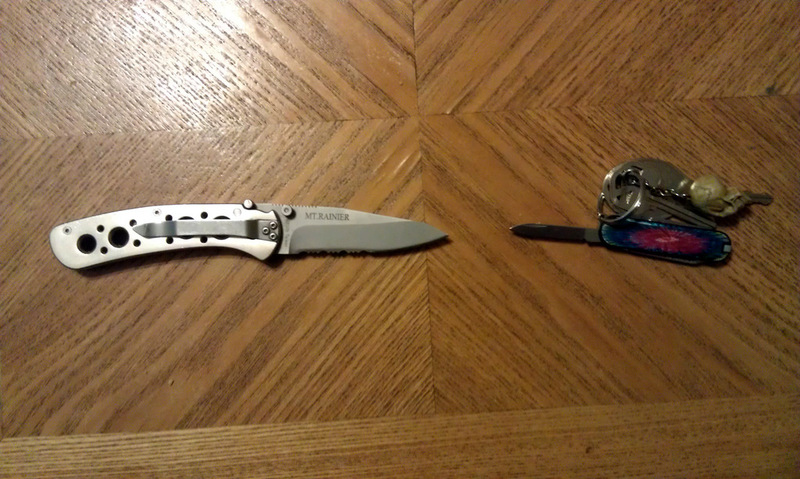 I also carry the tie-dye keychain Swiss army knife pictured on the right, but it’s debatable as to whether it counts! For a couple months, I was carrying a plain edge assisted open knife, but after the second time I reached into my pocket and found it had “assisted” itself open, I relegated it to car knife status and went back to this knife. I prefer the plain edge, but finding a half-open knife in my pocket in the middle of the airport made me reluctant to actually carry it on me! Also, be careful that your knife doesn’t slip out of your pocket in class without you noticing. My Nutrition professor was freaked that someone would actually carry a knife on campus, and the person at lost and found was puzzled as to why I would carry it, and asked if it was legal to carry. I’m much more confused as to why someone WOULDN’T carry a knife!